The latest members of the St Anselm’s community at Lambeth Palace have been commissioned by the Archbishop of Canterbury. Nineteen members – from various Church traditions – took their vows in a service at the palace’s chapel today (Friday) – an occasion which Archbishop Justin described as one of the highpoints of his year. The Archbishop, who is Abbot of the Community, prayed for them and presented each member with a cross, watched by their friends and families. He said he was welcoming them with profound emotion, with joy and with awe at the promises they were making. St Anselm’s provides an opportunity for young people aged 20 to 35 to “spend a year in God’s time” in new-monastic community with a shared Rule of Life focused on prayer, study and service to the most vulnerable in society. Most members are residential but the community also includes non-residential members who commit to the same Rule of Life while continuing in their work or studies in London. This is the fourth group since the Community was founded in 2015. This year’s group is drawn from 12 countries: the UK, Australia, Bahamas, Canada, France, Germany, Pakistan, South Sudan, Uganda, the United States, Zambia and Zimbabwe. Steven Semanda, 27, from Masaka in Uganda, said he had joined because he was seeking a much deeper experience of God and was attracted to the idea of life in a Christian community. Steven was raised an Anglican – his father, Kezlon Semanda, is the Dean of St John’s Cathedral, Kasaka, in the Diocese of Central Buganda – but had drifted in his spiritual life. He told ACNS that he was excited about the year ahead. “This will be a great opportunity to discover what God wants me to do with my life,” he said. 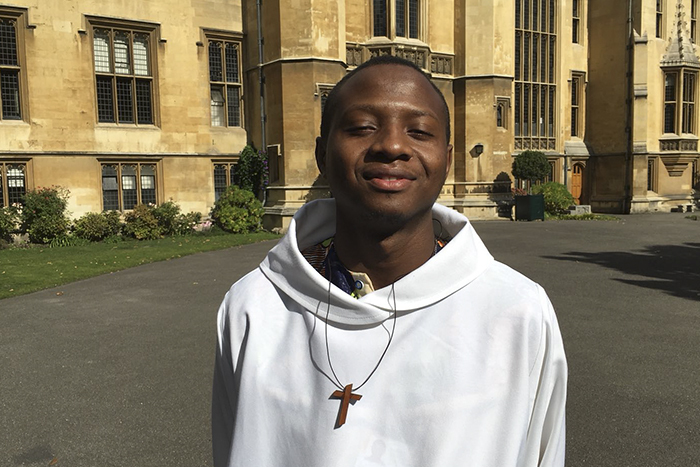 Steven Semanda from Uganda is one of 19 young people spending A Year In God’s Time with the Community of St Anselm at Lambeth Palace, the official residence and offices of the Archbishops of Canterbury in central London. Katy Hirst is one of three members of last year’s intake who are staying on for a second year. She will be helping the leadership team. She said her first year had not always been easy but it had been worthwhile. “When the prospect of staying for another year came up, it felt good to stay . . . to continue this journey of healing and freedom, but in a new way”, she said. In his sermon, Archbishop Justin said there was a common theme running through the testimonies from the new members of the community: they were a disparate people from different places, different cultures, and different origins who had all seen something special in Jesus. As followers of Christ, they were now part of the greatest nation on earth. He said the Church, and society, had something to learn from religious communities in the way they loved each other and put aside the things that could break them apart. That was the vision of St Anselm’s. Religious communities might be drops in the ocean, but they infect, in the best way, every part of the nation.